Anyways, lets get on with the screenshots! 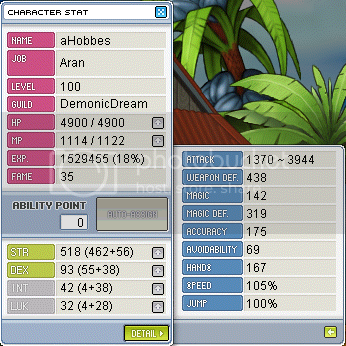 Anyways, my future with aHobbes looks pretty good. I'm on the way to joining 4305, a pretty prominent guild in the Bellocan community, and I plan on cubing my Arcglaive for something more desirable, maybe hammer it eventually. Hopefully I'll potential my ZHelm, PAC and WG and maybe get a top with better potential and finish it with top str scrolls as well as my bottom with bottom dex scrolls. About potential, it's MUCH better to use a scarlion over a zhelm, a giles cape over a pac, and a level 80+ glove over a WG. Scarlion over a zhelm.. It's the same as the pac's issues with potential, 2%/4%/6% vs 3%/6%/9%, plus it being 2 str or dex higher clean. If I were you, I'd leave the pac/WG unpotential'd, so you can MTS them for cubes when you do decide to cube new items. Off the potential topic, where will you be training to 120? o: Gallos or skeles? Consider mind blown. Holy crap, hobo, I didnt see this coming. thanks rob for all the advice, I didn't really know much about potentials and i guess you just saved me a ton of money cubing for potentials i couldnt even get. 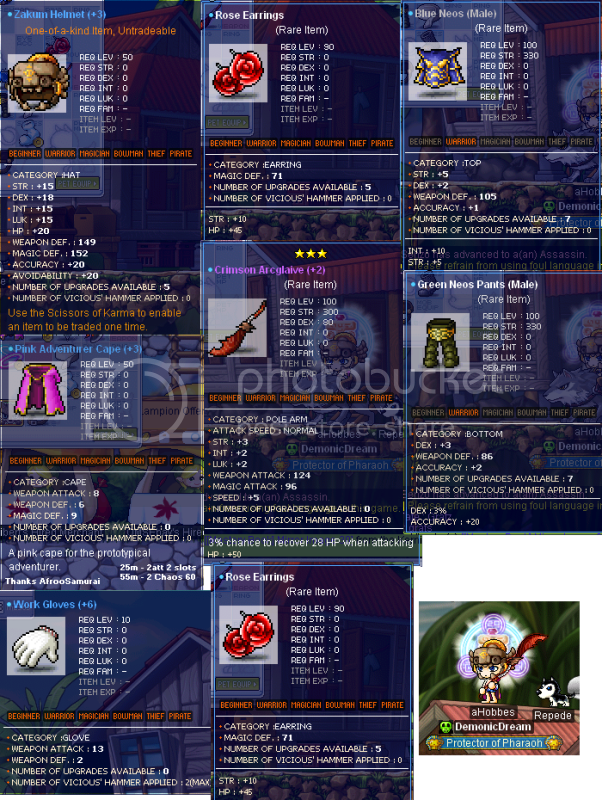 and I think i'll be gallo-ing to 120, might try out skeles if i feel like it if i have 0% or something (i've never been there before and I dunno how it really works, plus im dirty poor right now.) And about the giles cape, it gets better potentials because of it's level right? what if i were to advance potential something like a Ludibrium cape or something like that? would i get a better chance for good potentials? Any cape above 71 will give 3%/6%/9% and rare/epic/unique respectively per line. I suggest Giles capes, since they drop fasttt at gobies, while you only get one Ludi cape, it'd be easier to get a 3 line Giles cape than it would be to get a 3 line Ludi cape. oooh thanks for the tip! i'll make sure to slow down lol, lately i've been leveling once a day or something and I didn't plan on training on 2x this weekend so its all gooooooooood. So you do this instead of play Halo with Tich, I feel betrayed. I sold mine for around 45k, but it was hammered once. Yourse sold go for ~50k I think. I'm not too sure though, I sold mine 'cheap' cause I was desperate for the cubes. Also, make sure to get a 3 line giles cape, so you're more likely to get a higher STR % bonus. Edited by ¬Rob, 20 September 2010 - 04:48 AM. Curious, what are you scrolling your zhelm for? i didn't scroll my zhelm, I bought it scrolled like that. 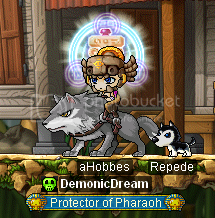 and I got a scarlion hat to replace my zhelm so that I could potential it for %str and that sort of stuff.